In this post, I cover the value of including people in natural landscape photos, and share an example of an “environmental self portrait” taken on the California Coast. In this post, I want to spend a little time talking about why I think landscape photographers are making a mistake by not–from time to time–including people in their photos, and even more of a mistake by not stepping in front of the camera ourselves. The landscape self portrait can be a very cool staged photo, and most landscape photographers own the original Selfie Stick: a tripod, so it’s fairly easy to accomplish. There are a few benefits in including people in a landscape photo. The first is giving a sense of scale to a scene. I can’t count the number of times I’ve visited a place that I’ve seen in photos and been amazed that it’s either much larger or much smaller than I expected. All I had seen were people-less landscape photos of the place, and it’s really hard to ascertain scale from a photo that lacks a known measuring stick. People in landscapes can also lend a sense of “adventure” (or man v. nature theme) to a photo, can make a photo unique, provide an interesting focal point or foreground subject, and can even show the “true” nature of a scene (for example, Tunnel View at Yosemite National Park looks pretty serene in photos, but the reality of the location is that you’re usually around hordes of other people at the edge of a parking lot, which is seldom conveyed in photos). These are just a few of the possibilities that the human element can bring to the table. Of course, there’s a flip side to this, and many landscapes are better as simply serene scenes that convey a sense of tranquility to the viewer. This is one thing I love about many of my favorite landscape photos–that beautiful experience of being alone with nature and the solitude of that moment the sun crests over the horizon, an intoxicatingly personal experience even when others are around. In other words, I’m not saying every landscape photo should have people in it–far from that, actually–just that it can be a good idea from time to time. The technique here is really simple as it’s just a matter of mounting your camera to a tripod, and using the camera’s self timer or a wireless remote to trigger the shutter. Which you use likely depends upon your distance from the camera, and whether you have a wireless remote. Most of the time, I use the self-timer with as long of a delay as possible (I also set it to take 3 shots, and adjust my pose a little for each one). There are some general preferences I have here, but they aren’t universally applicable. In general, I think all of the rules of portraiture go out the window with environmental portraits–you’re focusing instead on landscape photography rules. Unlike regular self portraits or portraits, my strong preference is for a wide angle lens in these situations, as environmental portraiture is as much about the environment as the person, so you don’t want the person overly dominant in the frame. Another difference between this and standard portraiture is that I prefer these type of photos to be ‘posed candids’ meaning that you’re not looking at the camera, but are instead in a contrived pose emulating the look of a candid. Since I’m not very clever with this, my pose is almost always looking off in the distance, as if I’m ready to conquer the land in front of me. That’s really it. The rest of the technique depends upon the particular situation. To illustrate the environmental selfie concept, I decided to go with a bit more challenging of a shot. However, unlike you might expect, the challenge here is all in taking the shot, not in post processing. 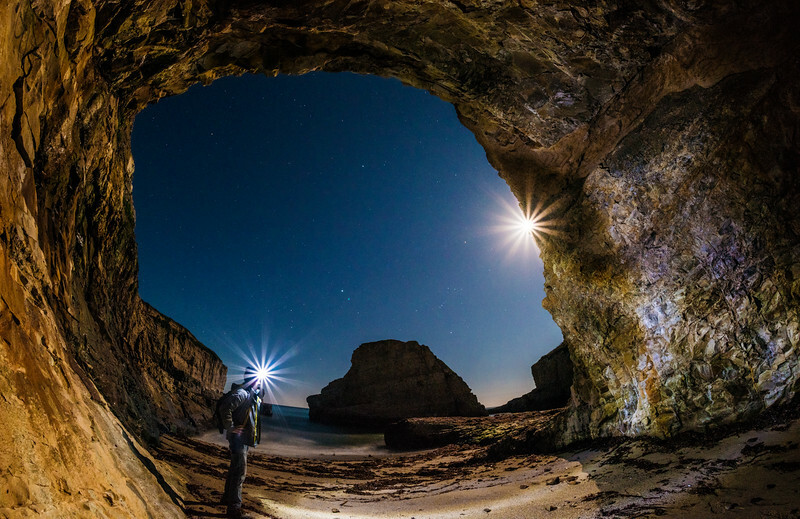 Originally, I was shooting this scene as a traditional landscape, trying to show the full moon peaking out from behind the edge of an ocean cave at Shark Fin Cove in the middle of the night during one of my crazy photography road trips with Bill earlier this year. Finding Shark Fin Cove was an adventure in itself that I’ll probably cover in a later post (an adventure that concluded with two police cars questioning whether Bill and I were doing meth down on the beach at 2 am), but suffice to say, it was worth it. For my traditional landscape shots, I was using my new Rokinon 12mm f/2.8 fisheye, (with my Nikon D810 mounted on my MeFoto travel tripod). I used an ISO of 400, shutter speeds of around 100-150 seconds, and an aperture of f/11 to get a moon-burst. I covered photographing moon-bursts in this post, so refer to that for my rationale on settings and general approach. Seeing the cool look of the moon-burst, I thought it might be interesting to get a photo of myself with my headlamp on and a starburst coming from that juxtaposed on the other side of the frame from the moonburst (the headlamp would also be helpful in illuminating the otherwise completely dark far side of the cave wall, so it really accomplished two purposes). This presented me with a problem: I can’t hold still for 100+ seconds. Now, with an environmental portrait with the subject fairly far off in the frame, a little movement doesn’t make a huge difference, but you obviously don’t want a blurry subject. This meant lowering the shutter speed, which would require either raising the ISO or opening the aperture. Since the cool part of the photo would be the bursts of the moon and my headlamp, both of which are achieved by stopping down the aperture, adjusting the aperture was not an option. I also didn’t want to raise the ISO too much, so I decided to push the shutter speed a bit in order to keep the ISO reasonable. Normally, for a photo like this, I wouldn’t want to push the shutter speed longer than 1-5 seconds, as it’s tough to stand still for very long beyond that. For the first shot here, I tried a shutter speed of 30 seconds. After the first set of these photos were done, I reviewed the results, and I was overly blurry in every single shot. On the plus side, the burst from my headlamp was so dominant in the frame that it was tough to see my face and thus difficult to tell how much it was moving. I knew this would give me a little latitude, so I then adjusted the shutter speed down to 20 seconds. Still way too long for most purposes, but I figured it would be fine here. It turned out that it was, and I ended up with 2 out of the 3 photos being passable. My end result for settings was f/11, 20 seconds, and ISO 800. It should be noted that much of the photo was way underexposed with these settings, but I didn’t want to adjust the ISO higher, as the sky was almost properly exposed, and a higher ISO would mean portions overexposed and more noise. One solution to this problem would have been to take a separate exposure for the dark parts of the photo, particularly areas inside the cave, and blend the two photos. The problem with this would be that it wouldn’t look authentic, as my headlamp created little shadows throughout the cave that wouldn’t be present in that longer exposure. Blending might produce a cleaner image, but it would also produce a photo that would look false to the discerning eye. My solution was to seriously open the shadows in Adobe Camera Raw, raising both the shadows and the darks to +100. I also increased the exposure to +.7. Pushing these three settings so dramatically left the photo looking flat, so I then increased the clarity to +60. This is way higher than I’d normally go with the clarity, but the photo needed so punch, and this helped overall, and really emphasized the texture in the cave walls. The unintended consequence was that it also increased the emphasis on the noise in the sky. From there, I opened the photo in Photoshop, applying a strong curves adjustment that both darkened the shadows and brightened the image (probably) another couple of stops. This, too, had the unintended consequence of emphasizing that noise in the sky. To combat this, I merged the adjustment layer with the background image, and then duplicated the background layer. I then applied a Surface Blur with a radius of 15, and threshold of 15. There’s no real rationale as to how I landed on these numbers, I always just sort of move the sliders around until I have a result that looks good. (There are much better ways to reduce noise via plugins, but I’m too cheap for those.) I then masked out everything besides the sky, so only the sky had this surface blur applied. Obviously, there’s still noise in the sky, but I think it looks a bit better. If I pushed the noise reduction too far, the stars would have been smudges. As far as post-processing, that’s it. It was a surprisingly simple photo to edit (total edit time was under 10 minutes). Most of the tough work was done in camera here, and pushing that shutter speed to 20 seconds (plus the light of the full moon and my headlamp) really made the editing process easy. I really want to try a shot like this with the Milky Way as the background, and that will be a ton more challenging both in terms of the shot itself and the post processing. I also think it will be worth it, since that photo would look way cooler. Overall, I’m satisfied with the end result here, and given the challenging circumstances, I don’t think I would have done much differently. In retrospect, I do sort of question the dual starbursts in the frame, as I wonder whether the casual viewer will realize that’s the moon peaking out from behind the cave wall. I’m not the kind of photographer who really minds a little noise in a photo, so the noise doesn’t bother me at all, but I think I probably could have found a natural way to merge two frames to reduce that noise. It just would have been a lot more work in post processing, and sometimes it’s nice for the end result to be produced from a single frame. Love the blog! Your post is inspiring me to take a short trip over to davenport while I’m in Santa Cruz. However, I’ve been planning a night expedition, but can’t seem to figure out where to park at night. Everything I’ve come across says that police start ticketing after 10pm. So I’m stumped. Gorgeous! Can’t wait to try this with my 5dii! Wish I had a lighter tripod to lug around on these selfie-taking excursions, though. Thanks! I don’t take many self portraits, but usually when I do, it’s because I take a landscape shot on a tripod, notice it might look good with a ‘human element’ and have no one besides myself there to step into the frame.